Among the most important target sites would be DNA bases. 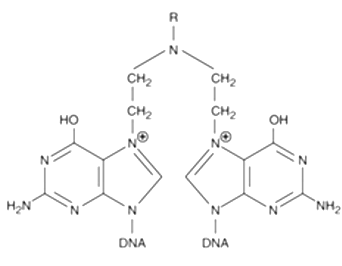 Interaction of alkylating agents and DNA probably represent the basis for their cytotoxic and therapeutic activity. These agents can target of many different types of cancer. 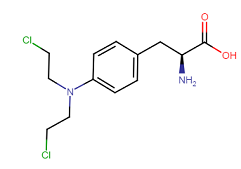 Probably the most frequently used drug among the alkylating agent to cyclophosphamide. Some cancers are treated with combination treatment containing more than a single alkylating-type agent. These effects inhibit cell division. Other possible mechanisms have been described. Therapeutic effects and cytotoxicities depend on alkylation of oxygen, reactive amines or phosphates on DNA. The N7 atom of guanine is a favorite site for covalent bonding with bifunctional alkylating drugs. The site may be the key target resulting in drug efficacy. Following N7 guanine alkylation, mispairing of guanine with thymine instead of cytosine may occur. Another possibility is disruption of the imidazole ring causing ring opening and ultimately removal of the damaged guanine. Molecular repair mechanisms targeting this damage stretch of the DNA, damage due to mispairing and/or imidazole ring opening may cause strand breakage. A third possibility with bifunctional alkylating agents (e.g. nitrogen mustards) is alkylation of not one but two guanine residues which produces cross-linkage of either to nucleic acid chains or of one nucleic acid to a protein. However, most alkylating agents enter the cell by diffusion and most alkylating chemotherapeutic drugs are not acted on by the "multiple-drug-resistance" export transporter systems. Activity of the enzyme is protective in these organs from nitrogen mustard toxicity. Cellular resistance of alkylating agents and increased glutathione cellular levels and levels of the enzyme glutathione transferase has been noted. Glutathione (GSH), a thiol-containing tripeptide, reacts with electro-deficient molecules thus protecting cells from these electrophiles. Increased GSH in cells found resistant to the alkylating agent melphalan. This result may be due to an increase in γ-glutamylcysteine synthase, which catalyzes the rate-limiting step in de novo GSH synthesis. Glutathione S-transferases (GST) catalyze reactions between electrophiles and glutathione however, most electrophiles react with glutathione spontaneously (at high rates thus reducing the need for enzyme-mediated catalysis). 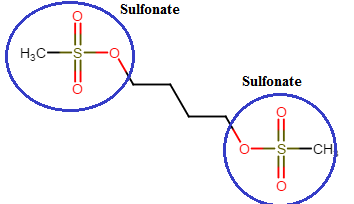 Glutathione-S-transferase is characterized by multiple isoforms or isozymes. Specific isoenzymes may catalyze conjugation of different alkylating drugs. These example agents also react with the N7 of guanine. Chabner BA General Principles of Cancer Chemotherapy Chapter 60 in Goodman & Gilman's The Pharmacological Basis of Therapeutics, 12th edition (Brunton LL Chabner BA Knollmann BC, eds; Brunton LL, ed; Blumenthal DK Murri N Hilal-Dandan R, assoc eds, Knollmann BC, consulting ed, on-line edition) The McGraw-Hill Companies, 2011. Sausville EA Longo DL Chapter 103e Principles of Cancer Treatment, in Harrison's Online (Dennis L. Kasper, Anthony S. Fauci, Stephen L. Hauser, Dan L. Longo, J. Larry Jameson, Joseph Loscalzo, Eds. ), Harrison's Principles of Internal Medicine, 19th edition, The McGraw-Hill Companies, Inc. 2015. Chabner BA Bertino J Cleary J Ortiz T Lane A Supko JG Ryan Chapter 61: Cytotoxic Agents in Goodman & Gilman's The Pharmacological Basis of Therapeutics, 12th edition (Brunton LL Chabner BA Knollmann BC, eds; Brunton LL, ed; Blumenthal DK Murri N Hilal-Dandan R, assoc eds, Knollmann BC, consulting ed, on-line edition) The McGraw-Hill Companies, 2011. Chabner BA Barnes J Neal J Olson E Mujagic H Sequist L Wyham Wilson Longo DL Mitsiades C Richardson P Chapter 62: Targeted Therapies: Tyrosine Kinase Inhibitors, Monoclonal Antibodies and Cytokines in Goodman & Gilman's The Pharmacological Basis of Therapeutics, 12th edition (Brunton LL Chabner BA Knollmann BC, eds; Brunton LL, ed; Blumenthal DK Murri N Hilal-Dandan R, assoc eds, Knollmann BC, consulting ed, on-line edition) The McGraw-Hill Companies, 2011. Moy B Goss P Lee RJ Smith M Chapter 63: Natural Products in Cancer Chemotherapy: Hormones and Related Agents. in Goodman & Gilman's The Pharmacological Basis of Therapeutics, 12th edition (Brunton LL Chabner BA Knollmann BC, eds; Brunton LL, ed; Blumenthal DK Murri N Hilal-Dandan R, assoc eds, Knollmann BC, consulting ed, on-line edition) The McGraw-Hill Companies, 2011. Rosenberg SA Robbins PF Phan G Feldman SA Kochenderfer JN Chapter 14: Cancer Immunotherapy in Principles & Practice of Oncology (DeVita, JR VT Lawrence TS Rosenberg SA, eds) 10e Wolters Kluwer Health 2015. Tew KD Chapter 17: Alkylating Agents in Principles & Practice of Oncology (DeVita, JR VT Lawrence TS Rosenberg SA, eds) 10e Wolters Kluwer Health 2015. Collins JM Cancer Pharmacology Chapter 29 in Abeloff's Clinical Oncology (Niederhuber JE Armitage JO Doroshow JH Kastan MB Tepper JE, eds) 5e Elsevier Churchill Livingstone, Philadelphia, PA 2014. SEER Training Modules, National Cancer Institute, Types of Chemotherapy Drugs: Alkylating agents http://training.seer.cancer.gov/treatment/chemotherapy/types.html accessed April 10, 2016. Roche VF Chapter 42 Cancer and Chemotherapy (in Foye's Principles of Medicinal Chemistry 7e Lemke TL Williams DA Roche VF Zito SW, eds) Wolters Kluwer | Lippincott Williams & Wilkins, 2013. Gerson SL Bulgar AD Weeks LD Chabner BA Chapter 14: Part A: Alkylating Agents: Classical Alkylating Agents in Cancer Chemotherapy and Biotheray: Principles and Practice 5e (Chabner BA Longo DL, eds) Lippincott Williams & Wilkins, a Wolters Kluwer business, Philadelphia, PA 2011. This Web-based pharmacology and disease-based integrated teaching site is based on reference materials, that are believed reliable and consistent with standards accepted at the time of development. Possibility of human error and on-going research and development in medical sciences do not allow assurance that the information contained herein is in every respect accurate or complete. Users should confirm the information contained herein with other sources. This site should only be considered as a teaching aid for undergraduate and graduate biomedical education and is intended only as a teaching site. Information contained here should not be used for patient management and should not be used as a substitute for consultation with practicing medical professionals. Users of this website should check the product information sheet included in the package of any drug they plan to administer to be certain that the information contained in this site is accurate and that changes have not been made in the recommended dose or in the contraindications for administration. Advertisements that appear on this site are not reviewed for content accuracy and it is the responsibility of users of this website to make individual assessments concerning this information. Medical or other information thus obtained should not be used as a substitute for consultation with practicing medical or scientific or other professionals.